There are millions of microbes in hands, and most of them are also infected via hands. That is why there is over million reasons for regular handwashing; proper hand hygiene is the easiest way to prevent infections from spreading. Tomorrow we celebrate the Global Handwashing Day dedicated to increasing awareness and understanding about the importance of handwashing with soap. “It is surprising how few people wash their hands properly to fulfil the requirements for good hand hygiene. Hands should be washed several times a day. It is also good to remember that proper drying of hands tops off handwashing. According to studies cotton or paper towels are the best materials for drying hands, because the mechanical abrasion produced by using them reduces the amount of microbes in hands essentially. 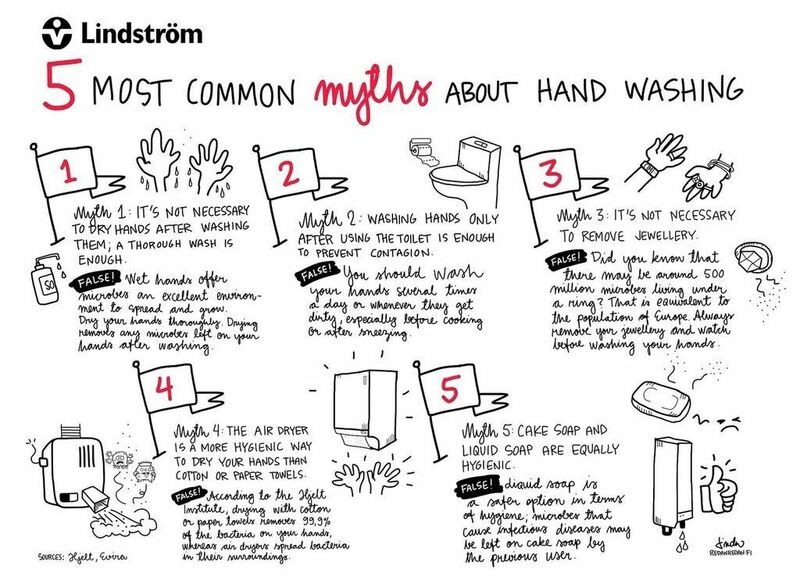 Drying with cotton or paper towels removes 99.9% of the bacteria on your hands, where as air dryers spread bacteria in their surroundings*,” says the expert of hand hygiene at Lindström, Marja Hautanen. Would you like to know more about methods for proper hand drying? Read more about our hygiene services.